Local SEO is critical for local businesses. We help you gain exposure in Google Maps and organically in your market for your targeted products and services. SEOteric’s local SEO services are designed to help local businesses capitalize on searches done for products and services in their markets. Getting local visibility is really about building local relevance and importance in the eyes of customers and search engines. The speed and effectiveness of local campaigns weighs heavily on the number of competitors in the space, the size of the market, and the demand for the product or service. Some industries and markets are easier to get traction in than others. No matter the competition, there is a proven road map to local SEO success. One of the most impactful things a local business can do is to have a complete, rich, and verified local business listing in Google. This listing alone can (for some smaller businesses) be enough to get the phones ringing with new customers and opportunities. Below is a snapshot of a typical “three-pack” of local businesses. The three listings below the ad are local business listings in Google. Much like Google ranks the organic results, it also ranks business listings in order of importance and relevance for users. In order to get your local business listing to rank in one of the top spots, you need to get a few things right. As you can see, we dominate the results with 3 positions – paid ads, local listings, and the #1 organic result. 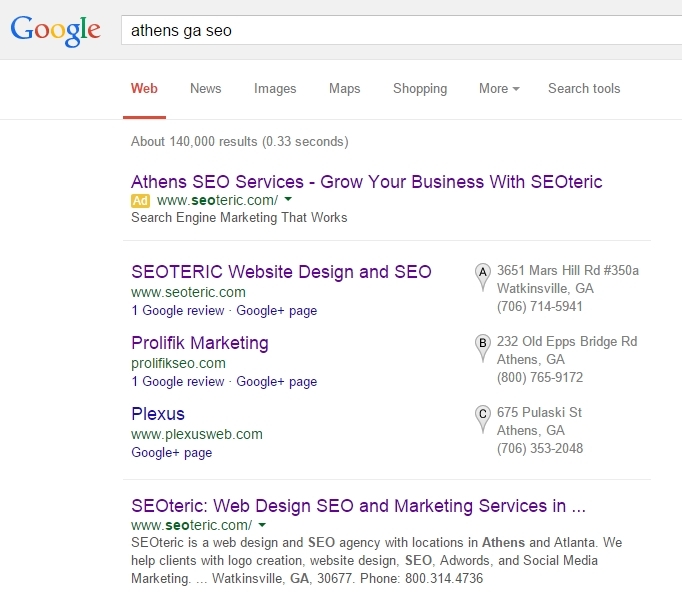 And our office isn’t even in Athens – it’s in Watkinsville, a smaller town just outside of Athens. We’ve created relevance and importance using our proven processes. 1) Completely fill out your business profile. Having a full and established profile with accurate categories, in-depth descriptions, appealing avatars and banner images, hours, and contact information will add importance to your listing. The more informative your listing is for users, the better result it is. We create in-depth and meaningful content for our client’s Google+ pages and listings to give them the best chance to rank well in the local business listings. 2) Get Other Important Local Listings and Citations. Often overlooked in ranking local businesses is the importance of having other credible sources also list your business. These other local business listings count as citations and send Google valuable information about your company such as your category, your location, and additional credibility. A business that lacks other local listings may be viewed as less important than businesses that have other credible listings. Other business listing providers include websites such as Yelp, YP, InfoUSA (InfoGroup), DMOZ (yes, its still an important citation), Yahoo!, Bing, and Foursquare just to name a few. We create and monitor close to 200 local business sources for our clients to make sure they are listed and have links and citations from the websites and services that matter. 3) Maintain Consistency Across Other Local Listings. Your NAP (Name, Address, and Phone) properties are an important part of your listing profiles. Google looks for and expects this information to be accurate and consistent when it is found on other services. Make sure to keep contact info up to date, post accurate hours and descriptions, and use the same business name on all your listings. Don’t overly “optimize” it either. Use the official business name, and allow your categories and descriptions to carry the keywords. The number one principal is to keep things consistent. 4) Provide Schema.org and Rich Snippet Markup. This is a more technical note, but make sure you have the appropriate code on your website to give search engines your local data. You can use Google’s Structured Data Testing Tool to see if you have this installed or not. If you are comfortable with editing website code, you can go to http://schema-creator.org/ and generate the code to embed in your website. When it is done properly, the testing tool will give you a green check and display the information it is getting from your markup. As you can see, we send Google our local business markup and it validates with their testing tool. In this example, we open the link in a new tab, insert the link address, and add the rel=”publisher” tag. That’s about it. This will help connect your business page to your brand, and get your business information to appear in the sidebar of Google search results when someone searches your brand name. Getting your website linked also helps drive traffic to your website as opposed to your Google+ page. We want visitors on our websites, so make sure to get your website address on the local business listing and Google+ page. 6) Get your local business listing verified. This could easily be step 1.A or step 2 because of its importance. Verified listings show up. Unverified listings do not. Its that simple. Google offers a few ways to verify, and the most common are via telephone (the number you put in the business listing) or a postcard sent to your address. Phone verification is easier and quicker, but sometimes you have to verify via postcard. Postcards usually arrive in 1-2 weeks, so make sure to keep an eye out for the Google postcard. It will have a pin number on it that you will use to verify your listing. 7) Publish content to your page. Don’t just create your Google+ page and leave it. You need to make it as relevant as possible, so use it as a hub for your blog post, testimonials, service content, and any other content that will add value to your readers. Include links to other websites and to your website, and highlight important content. 8) Get reviews. Good ones. Real ones. Reviews are another signal that tells Google if you should rank higher or lower. The more positive reviews you have, the better. You need to be careful here, as to not incentivise reviews, as that goes against Google’s quality guidelines, but don’t be afraid to ask for reviews. Put review links on your website. Ask for them at checkout or in a followup email. If you are providing good service, you should be able to attract good reviews. And if you ever receive a bad review (warranted or not), be sure to respond quickly and resolve the issue. Many times, a successful resolution of the problem that instigated the negative review may just as effectively cause its removal. You can also ask for it to be removed if the matter is resolved. 9) Have a locally relevant website. The website that your local business listings links to can impact its ability to rank locally. Make sure you provide good and relevant content, supporting images and media, and use your location city name in your website. Publish your address on your website along with your contact information. If you have a physical location, go ahead and embed a Google map with directions. And as mentioned above, link to your Google+ page and other relevant websites and listings. Yahoo! and Bing listings should be created right after your Google local business listing. Save the information you used for Google, and use that to create a listing here. You will also need to verify these listings just like the Google listing for them to show up. We start with Google and we emphasize Google because Google accounts for more than 75% of the organic traffic our clients receive, even when they rank well in all three search engines. Local citations and local links also influence the ranking ability of Google local business listings as mentioned above. The process can be daunting for the do-it-yourself marketer. There are services that help with this aspect like YEXT and some others, but once you stop paying for the services, many of the listings will (or could, as described by YEXT) disappear. We take several weeks and develop each listing manually on the most important websites to ensure that the information is accurate. We also employ weekly monitoring of these listings and syndication services such as Moz Local to get maximum exposure and consistency. The process usually takes 4-8 weeks to get it completed and done right, and then we monitor each listing to make sure they stay accurate and active. Local links can come from local business listing sources or websites in your market. Links from websites in the same area can improve local relevance and help drive some traffic. You also get the added benefit of an improved backlink profile and improved credibility signals. We look for complementary businesses and community involvement opportunities that can turn into link opportunities. Being active in a community helps build goodwill, branding, and SEO signals when you leverage those opportunities for links. Remember, the goal is relevant and quality links – not quantity. Content can be a great differentiator. When you look at websites, you tend to see a resume style of content. Here is who we are and what we do. Website content often makes the same mistakes that resumes do, in that they only describe a product or service. If you are competing with other companies and all you do is describe your product or service, there isn’t anything that makes you stand out from the crowd. We help our clients create content that answers all the questions and creates a resource for Google. The point of Google is to get users to websites that best answer a search query. What we are really asking is “who is the best plumber to use?” or “Where should I go to get my car serviced?”. We trust that Google ranks these businesses based on their trust and how good they are. In the minds of customers, if Google ranks a business highly, it must be good. Your business needs to be the right answer for a search question or keyword search. How do we do that? It starts with content. As a business website, we should become the Wikipedia of our space. Provide useful content centered around what you do or what you sell. Demonstrate what you have and explain what needs or wants it meets. Provide rich media and images so I can see what I am getting and know what to expect. Compare your products or services to others and tell why it’s better or different. Explain why you are the right place to get what I need. I need to fully understand it, need it, and want to get it from you. If you can give that experience to your website visitors, then Google will start seeing you as a resource and rank you higher. Localization plays a big part in this. I need to know that your product can be obtained easily considering the proximity to me. If you have a product that can be shipped and still give me a good price, I’ll take it. If you are offering a service, are you close enough to me that you can deliver your service to me promptly and without additional travel costs or fees? When the customer feels confident about the product or service, and the business providing it, the chance of conversion increases greatly. Speaking of conversions, SEOteric understands the importance of turning website visitors into customers. As a part of our top-tier local SEO services, we offer an “Intelligent Marketing” package. Intelligent Marketing is an approach that uses dynamic content customization and lead tracking to better influence conversions. Put simply, if a customer walks through your doors, you ask some questions to get an idea of what their needs are and what products or services might fit their needs. You process that information and deliver a recommendation and a call to action based on that particular type of customer. Typical websites can’t do that. Sure, we can create pages of content and try to get users to navigate to the right place, but what if we could tailor a message to each user based on their history or how they found us? What if returning visitors got a different experience than first time visitors? What if known leads come back and are greeted with a message specific to them with a stronger offer? We could train our website to understand customers just like we do. That’s what Intelligent Marketing is. It creates known segments of your website visitors and sets up customized content and experiences based on what they need, what type of lead they are, and how they found us. The result is an experience that helps convert them into customers. This type of marketing has long been reserved for enterprise level businesses, but with our unique local marketing packages, you can now get access to enterprise level marketing on a local level and better target your customers in your market. For local businesses that want to expand their online footprint outside of their city, we offer a service area SEO campaign to do just that. If your business can provide services within a 30 or 40 mile radius, why would you only target a 10 mile radius and just one city? We help our clients get traction in multiple cities adjacent to their location using local business listings and content. In many cases, we can get local business listings to appear in several cities close to your main location and get local landing pages to rank organically. This helps increase traffic and where customers come from. If your business can expand its market online, and still make customers feel comfortable in choosing you, then you can really see your business begin to grow and expand its reach. Each additional city to target is like its own mini SEO campaign, needing content development, local citations and link signals, and local business listing updates. These mini campaigns often produce great results by casting a much wider net for customers. Larger metro areas like Atlanta or Miami offer unique challenges since there are so many more competing businesses and so much demand. Getting ranked in a major metropolitan city takes a lot longer and requires much more effort, but the amount of traffic and business growth you receive from these markets is significantly higher. If you are in a larger city and having trouble ranking locally, we can help. We know the challenges stiff competition can create, and we’ve helped clients successfully overcome these challenges to really grow their revenues. If you are in a smaller city and want to grow into a major metro market, we also have strategies that can help you do that. Whatever the challenge, SEOteric has the experience and the results to get you where you want to be when it comes to Local SEO.